Who really wrote the Book of Mormon? One thing is certain: the Book of Mormon itself gives a great deal of attention to answering this question. Indeed, one of the most notable features of the Book of Mormon is the fact that its fifteen books, all of which are purportedly historical narratives, are attributed to ancient Israelite authors who refer to themselves by name explicitly in the first person. Although this feature is widely known especially with regard to the opening verse of the Book of Mormon, “I, Nephi” (1 Ne. 1:1), what is not widely known is that it exposes the work’s modern origin. This study will explain why. Each book bears the name of its author, with the final book in this series, Omni, bearing the name of the first of its five authors, each of whom has only a very short contribution. The other nine books are attributed to two authors: Mormon (Words of Mormon through Book of Mormon 7) and his son Moroni (Book of Mormon 8-9, Ether, and Moroni). Mormon describes himself as “a pure descendant of Lehi” (3 Ne. 5:20; see also Mormon 1:5), meaning that he was a direct lineal descendant of Lehi,1 just as were the nine authors of the first six books. His son Moroni later adds that he and his father were descendants of Nephi (Mormon 8:13). Mormon’s narrative covers the period from about 130 BC to about AD 385. Mormon’s son Moroni then finishes his father’s record (Mormon 8:1), inserting into the record his account of the people who had inhabited the land before the arrival of Lehi’s family (the Book of Ether, named for the individual whose ancient account Moroni says he is abridging). In addition, the Book of Mormon states that only “descendants of Nephi” were authorized to rule as kings (Mosiah 25:13), which confirms that Benjamin, who received the plates from Amaleki (Omni 1:23, 25; Words of Mormon 1:10-11), was a descendant of Nephi, as was Benjamin’s son Mosiah2 (Mosiah 1:15-16), who received the plates from Benjamin and later passed them down to Alma2. Thus, the Book of Mormon presents all of the 22 men following Nephi who took custody of the plates from one generation to the next after him were his descendants. The authors of the books are identified in two ways. For nine of the books, the author’s name is in the title of the book. For the other six books, which are said to have been abridgements by either Mormon or Moroni of earlier writings, the first author of those earlier writings serves as the name of the book (e.g., Alma was the first author of the material Mormon abridged as the Book of Alma).3 The titles of all fifteen books are understood to have appeared on the gold plates and to have been translated by Joseph Smith more or less literally. The one qualification is that the books named for the men named Nephi have been numbered as 1, 2, 3, and 4 Nephi. The other way in which authors are identified is by self-referencing statements in the first-person singular. There are hundreds of first-person singular statements in the Book of Mormon, but more specifically there are 158 statements of the form “I, Nephi” and similar direct self-identifying statements presented as having been made by the eleven authors. To be more precise, there are 148 “I, Name” statements, 6 “me, Name” statements, 3 “I am Name” statements, and 1 “I am called Name” statement attributed to the eleven authors. There are also some 22 such self-identifying statements by figures whose writings and speeches are said to be abridged in the Book of Mormon, such as Lehi (2 Ne. 1:6, 9; 2:17) and Alma (Alma 5:3, 61; 9:1, 31).4 Our concern here, though, is specifically with the 158 self-naming statements by the men that the text presents as the authors of the books in the Book of Mormon that Joseph Smith claimed to have translated. The table below provides a detailed overview of those 158 authorial self-naming statements in the Book of Mormon. Citations followed by [bis] have two occurrences of the expression. “The Five” are Omni, Amoron, Chemish, Abinadom, and Amaleki. Some explanations will be helpful for understanding the data given in the table. The table shows each book of the Book of Mormon listed in the order of Joseph Smith’s dictation of the manuscript to his scribes, which began with Mosiah. To give some sense of proportion the number of chapters in each book is given in the second column. The third column gives the total number of authorial self-naming statements in each book. The “Book of Mormon” that follows 4 Nephi is split into Mormon 1-7, which is credited to the Nephite prophet Mormon, and Mormon 8-9, which is an appendix to the book credited to his son Moroni. The fourth column names the author of each book, ignoring self-naming statements attributed to the writers or speakers of the sources that the author quotes or abridges in his book (e.g., Alma and Helaman). The fifth column cites the references in each book in which the authorial self-naming statements appear. The table shows that every one of the eleven authors has authorial self-naming statements in the material he is said to have written. This is true even for “the Five” in the Book of Omni, each of whom has at least one such statement (the last of the Five, Amaleki, has three of them). Thus, the Book of Mormon explicitly identifies its authors both in the titles of the books and in first-person statements within the text in which the authors refer to themselves by name. 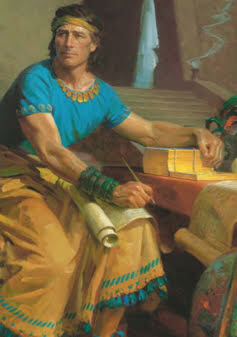 Since Joseph did not know whether the lost manuscript would show up or not, when he resumed his dictation he did not begin with that parallel account, but instead continued dictating where he had left off in the narrative, with the reign of Benjamin, at or about the beginning of the current Book of Mosiah.6 Only after dictating the remainder of the books through Moroni did he produce the translation of the Small Plates (1 Nephi through Omni) to replace the narrative that covered the period from Lehi to Benjamin. It turns out that the distribution of authorial self-naming statements in the Book of Mormon correlates with the order in which Joseph dictated the manuscript. Authorial self-naming statements appear from 3 Nephi 5 through Words of Mormon at an average of about one and a third per chapter (158 occurrences in 117 chapters), or about three every five pages (158 occurrences in 260 pages). Oddly, however, there are no authorial self-naming statements from Mosiah 1 through 3 Nephi 4, a continuous stretch of 122 chapters and about 271 pages of the printed text of the English Book of Mormon (51% of its 239 chapters and of its 531 pages). The order in which these statements in the Book of Mormon are reviewed appears to make a difference. If we read the Book of Mormon in canonical order, we find that the first quarter has a lot of authorial self-naming statements (125 in 144 pages from 1 Nephi through Words of Mormon), the middle half has none at all (from Mosiah 1 through 3 Nephi 4), and the last quarter has a fair amount of them (33 in 116 pages from 3 Nephi 5 through Moroni 10). However, a much simpler pattern appears when we read in the order of Joseph Smith’s dictation. For the first half of his dictation (Mosiah 1 through 3 Nephi 4), there were no authorial self-naming statements, but in the second half of his dictation (3 Nephi 5 through Words of Mormon) there were 158 such statements. This phenomenon needs to be explained and merits closer attention. We might begin by addressing two seemingly simple explanations for the lack of authorial self-naming statements in the first half of the manuscript that Joseph Smith dictated. One such explanation would be based on the fact that the half of the Book of Mormon that lacks authorial self-naming statements is all attributed to Mormon. Given this fact, one might suppose that Mormon simply chose not to draw attention to himself in the way that the other authors did. However, this explanation will not work. Mormon is credited with far more than half of the Book of Mormon. He is credited with 337 of the 531 pages of the Book of Mormon (64%), or 147 out of its 239 chapters (62%). Mormon has 18 authorial self-naming statements in Words of Mormon and 3 Nephi 5—Mormon 7, but none in Mosiah 1—3 Nephi 4. From 3 Nephi 26 through Mormon 7 and in Words of Mormon, there are 16 authorial self-naming statements by Mormon in 16 chapters, which is close to the frequency one finds in the books attributed to the other authors. Thus, the lack of authorial self-naming statements in Mosiah through 3 Nephi 4 is not due to any stylistic difference in Mormon’s writings as compared to the other writings. A potentially better explanation might be that Mormon made no authorial self-naming statements in the books that he wrote as abridgments of earlier works by other authors. This explanation would account for the lack of self-naming statements by Mormon in the books of Mosiah, Alma, and Helaman. However, this explanation also does not work, for at least three reasons. (1) There are five self-naming statements by Mormon in 3 Nephi and one in 4 Nephi. Both of those books are also supposed to be abridgments of earlier works by other authors. (2) The Book of Ether is said to have been an abridgment by Moroni of an earlier work, and there are 11 self-naming statements by Moroni in its 15 chapters. (3) Mormon does refer to himself in the first-person singular at least seven times in the books of Mosiah, Alma, and Helaman (Mosiah 8:1; 28:9, 20; Alma 22:35; 43:3; Helaman 2:14; 3:17), just without giving his name. The above explanations that presuppose the historicity of the Book of Mormon authors in effect treat the fact that the first half of Joseph’s dictation lacked authorial self-naming references while the second half was full of such references as a coincidence. The possibility that it was not a coincidence needs to be considered. There is another problem that makes this second explanation completely untenable. The first of Mormon’s self-naming statements introduces him to the readers as if it were for the first time: “And behold, I am called Mormon…. Behold, I am a disciple of Jesus Christ, the Son of God. I have been called of him to declare his word among his people, that they might have everlasting life…. I am Mormon, and a pure descendant of Lehi” (3 Nephi 5:12-13, 20). What is puzzling about this self-introduction is that it comes so late in Mormon’s narrative. He had already written what in the modern printed editions are 122 chapters or 271 pages prior to offering these statements about himself as the author. Thus, ten of the eleven authors of the Book of Mormon introduce themselves explicitly by name in the opening words of their books. The one exception is Mormon, who as mentioned previously occasionally writes in the first-person singular but does not introduce himself or make any self-naming statements until 271 pages into his narrative. Why might this be? Mormon’s Self-Introduction: Why So Late? Mormon’s self-introduction ends at this point. The rest of the chapter consists of prophetic assurances of a future gathering and restoration of the scattered seed of Jacob (3 Ne. 5:20b-26). Mormon’s role as author and editor clearly dominates his self-introduction, accounting for 272 words out of 367 words (5:8-11, 14-19), or a whopping 74% of the passage. Personal information about Mormon’s name, heritage, and lineage account for 64 words (5:12, 20a), about 17% of the passage. References to Mormon’s status as a “disciple,” by contrast, take up just 31 words (5:13), a mere 8% of the passage. To construe the passage “as an introduction from Mormon the apostle, not Mormon the editor” is simply not credible. He makes his first authorial self-naming statement (5:12; true for all ten of the other authors). He acknowledges that he is not including all of the available information (5:8; so also Nephi, Jacob, Jarom, Amaron, Chemish, and Moroni). He makes specific reference to the plates on which he is writing (5:11; so also Jacob, Jarom, Omni, Amaron, Chemish, Moroni). He asserts that he has personal knowledge of at least some of what he writes (5:17; so also Nephi, Enos, Omni, and implicitly all of the others). He makes reference to the language in which he wrote (5:18; so also Nephi and Enos). The passage in 3 Nephi 5, then, was clearly meant to be Mormon’s self-introduction, performing the same function in the narrative as the self-introductions that begin the writings attributed to the other ten Book of Mormon authors. Yet this finding, despite being well supported in the text, is obviously incompatible with the idea that Mormon had already written the equivalent of over four hundred printed pages. This discrepancy leads to a conclusion that is rather obvious, if unsatisfactory to those who insist on the historical authenticity of the Book of Mormon. That conclusion is simply this: Joseph Smith composed Mormon’s self-introduction. We know with a fairly high degree of confidence that after the loss of the 116 pages, Joseph began his new dictation of the Book of Mormon with Mosiah. What those 116 pages contained in fine detail is unknown. We do know that Joseph dictated Mosiah through 3 Nephi 4 largely in the third person, with just occasional uses of the first-person singular “I” by the narrator. We are lacking not only the Book of Lehi but also the original beginning of the Book of Mosiah. It is likely, as Hardy and Gardner have suggested, that a self-introduction by the narrator Mormon existed at the beginning of the Book of Lehi, the first of the books he is supposed to have written as an abridgment of an earlier work. Joseph Smith decided to begin his new dictation where he had left off, in the Book of Mosiah, very likely because he hoped that the lost pages would surface before he needed to replace them. As the dictation progressed he would have realized that the chances of the pages showing up were dwindling. After dictating Mosiah through Helaman, Joseph evidently decided that he needed to introduce the narrator even though the introduction was supposed to take place at the beginning of his account. Joseph therefore composed a new self-introduction for Mormon in 3 Nephi 5. Then, as Mormon’s account of Jesus’ visits and speeches to the Nephites was winding down, Joseph began incorporating into the account authorial self-naming statements beyond what was needed for each author’s self-introduction, beginning with three such statements by Mormon toward the end of 3 Nephi (26:12; 28:24), one in 4 Nephi (1:23), and nine in Mormon 1–7. With Mormon’s writings at an end, henceforth Joseph Smith had each author introduce himself by name at the very beginning of his account: Moroni (Mormon 8:1); Nephi (1 Nephi intro., 1:1); Jacob (Jacob 1:1); Enos (Enos 1:1); Jarom (Jarom 1:1); and the five prophets in the book of Omni (Omni 1:1, 4, 9, 10, 12). Except for the four authors of Omni whose combined accounts add up to only eleven verses (Omni 1:1-11), each Book of Mormon author is shown making additional authorial self-naming statements. Mormon also refers to himself at the beginning of Words of Mormon (1:1) but not to introduce himself, since this book is presented as having been written after Mosiah through Mormon 7, just before he passes on the plates to Moroni. Joseph composed Words of Mormon (1:1-11) at the very end of his dictation process, adding it between the “plates of Nephi” (1 Nephi—Omni) and the “plates of Mormon” (Mosiah—Moroni) in order to explain the complicated structure of the whole that was necessitated by the loss of the 116 pages. This reconstruction of how the Book of Mormon came to have Mormon’s self-introduction in 3 Nephi fully and plausibly accounts for all of the known facts. That cannot be said for the notion that Mormon composed two self-introductions, one of which happens to be lost. In addition, the distribution of all 158 of the authorial self-naming statements in the second half of Joseph’s dictation of the Book of Mormon is best explained as a shift in Joseph’s compositional strategy. These two findings strongly support the broader conclusion that Joseph Smith is the real author of the Book of Mormon. 1. John L. Sorenson, “Book of Mormon Peoples,” Encyclopedia of Mormonism, ed. Daniel H. Ludlow (New York: Macmillan, 1992), 1:191. Brant A Gardner calls this “the most conservative reading” but offers no specific alternative; see Second Witness: Analytical and Contextual Commentary on the Book of Mormon (Salt Lake City: Greg Kofford Books, 2007), 5:275. According to the Book of Mormon, the peoples inhabiting the land during that period included “the people of Zarahemla” led by Mulek (said to have been a son of the last king of Judah, Zedekiah) who had escaped from Jerusalem about the same time as Lehi and settled in a different area (Omni 1:14-21; Mosiah 25:2; Hel. 6:10; 8:21). This would mean that only some of the inhabitants of the land would be descendants of Lehi. LDS scholars anxious to argue that the entire population of the land was never monolithically Israelite therefore cannot legitimately appeal to 3 Nephi 5:20 in support. Cf. Ugo A. Perego and Jayne E. Ekins, “Is Decrypting the Genetic Legacy of America’s Indigenous Populations the Key to the Historicity of the Book of Mormon?” Interpreter: A Journal of Mormon Scripture 12 (2014): 242 (237-79). Perego and Ekins acknowledge in a footnote (n. 7) that 3 Nephi 5:20 may simply be distinguishing Mormon’s ancestry from that of Mulek’s people. By “pure” descendant the text may mean that Mormon’s family tree included no ancestors from the Mulekites, or perhaps that Mormon was a direct patrilineal descendant of Lehi. 2. The figure of 22 men assumes the usual view that the man identified as Nephi in 4 Nephi 1:19 is a different man than the one whose writing was the basis for the book of 3 Nephi. This is actually uncertain given the information in the text. Following standard LDS convention, a subscript number is used to differentiate Book of Mormon men with the same name, e.g., the first Alma’s son is designated Alma2. The Nephi credited as Mormon’s source for 3 Nephi just happens to be the third man chronologically in the Book of Mormon with that name, hence Nephi3. 3. Note that this explanation also accounts for the naming of the Book of Omni, which though not an abridgment is credited to five authors and is named for its first author. This is a simpler explanation than Gardner’s theory that changes in book names are related to shifts “in the ruling dynasties and the passage of the plates in and out of those dynasties”; Gardner, Second Witness, 3:94. Gardner admits that the change from Helaman to 3 Nephi does not fit his theory. 4. See also the “I, Mormon” statement in a speech by Mormon quoted in his son’s book (Moroni 7:2). 5. The case has been most thoroughly presented in (non-LDS) Brent Lee Metcalfe, “The Priority of Mosiah: A Prelude to Book of Mormon Exegesis,” in New Approaches to the Book of Mormon: Explorations in Critical Methodology, ed. Brent Lee Metcalfe (Salt Lake City: Signature Books, 1993), 395-444; and (LDS) John W. Welch, “The Miraculous Translation of the Book of Mormon,” in Opening the Heavens: Accounts of Divine Manifestations, 1820-1844, ed. John W. Welch, Documents in Latter-day Saint History (Provo, UT: BYU Press; Salt Lake City: Deseret, 2005), 115-17 n. 111 (77-213). Other LDS scholars who agree include Matthew Roper, “A More Perfect Priority?” [review of Metcalfe], Review of Books on the Book of Mormon 6/1 (1994): 362 (362-78); Royal Skousen, ed., The Original Manuscript of the Book of Mormon: Typographical Facsimile of the Extant Text (Provo, UT: FARMS, 2001), 33; Alan Goff, “Positivism and the Priority of Ideology in Mosiah-First Theories of Book of Mormon Production,” FARMS Review 16 (2004): 11-36; Brant A. Gardner, The Gift and Power: Translating the Book of Mormon (Salt Lake City: Greg Kofford Books, 2011), 298-99; and Jack M. Lyon and Kent R. Minson, “When Pages Collide: Dissecting the Words of Mormon,” BYU Studies Quarterly 51/4 (2012): 122-23 (120-36). 6. What is now Words of Mormon 1:12-18 evidently was either part of the opening chapters of Mosiah (where, on this view, the present chapter 1 should be chapter 3) or composed by Joseph Smith to replace the lost opening material of Mosiah. For the former theory, see Lyon and Minson, “When Pages Collide”; for the latter theory, see Brant A. Gardner, “When Hypotheses Collide: Responding to Lyon and Minson’s ‘When Pages Collide,’” Interpreter: A Journal of Mormon Scripture 5 (2013): 105-119. On either view, the original Words of Mormon (if it existed) would have consisted only of Words of Mormon 1:1-11. 7. The quotations here in some places conform to the wording of the Printer’s Manuscript (minus later editorial changes) and so differ slightly from the current printed editions. 8. Grant Hardy, Understanding the Book of Mormon: A Reader’s Guide (Oxford: Oxford University Press, 2010), 296 n. 9. 9. The books of 1 Nephi through Omni, which replaced the lost 116 manuscript pages, are themselves about 115 manuscript pages. Thus, from the presumed self-introduction by Mormon at the beginning of his Book of Lehi to his second self-introduction in 3 Nephi 5 would be roughly 415 pages, the same as the number of pages from 1 Nephi 1 to 3 Nephi 5. 10. Gardner, Second Witness, 5:272-73.